The ConforMIS iTotal (the "i" stands for individualized) is a patient-specific knee implant intended for use as a total knee replacement for patients with knee joint and disability. The iTotal is appropriate for patients of any age whose conditions cannot be solely addressed using an implant designed to treat only one or two of the three knee compartments. A condition treated by using the ConforMIS iTotal is Osteoarthritis. Osteoarthritis is a degenerative joint disease characterized by the breakdown and eventual loss of joint cartilage. The breakdown and wearing away of cartilage causes the bones to rub together resulting in extreme pain. 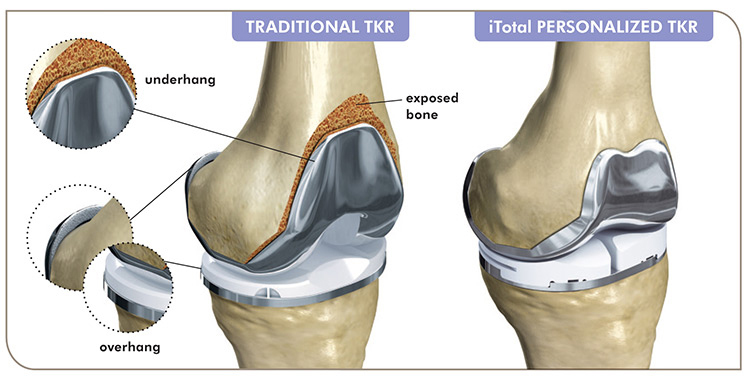 Combining proven total knee replacement (TKR) principles with the unique advantages of a ConforMIS patient-specific knee system, ConforMIS has developed the only personalized total knee replacement implant designed to conform precisely to your own unique anatomy. The ConforMIS approach is based on the principal that because people vary in more ways than gender, race and size, so should their implant. Our implants are personalized to fit your knee and only your knee. Developing your personalized implant begins with a CT scan, which will be used to generate a 3-D virtual model of your knee. Our implants are personalized using a proprietary software that uses a CT Scan to create a 3D virtual model of your knee. 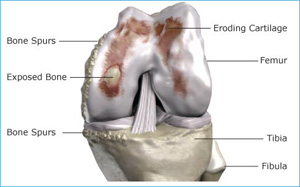 The 3D model is then used to design and manufacture a personalized knee implant and instrumentations just for you. The personalized instrumentations are referred to as our unique iJig instrumentation. These iJigs are also made specifically for the shape of your knee and are designed to improve alignment and provide a more natural feel to your knee. Improved alignment can reduce implant wear and extend the longevity of your implant. Personalized implants offer unique advantages versus traditional knee replacement. Because each ConforMIS implant is designed specifically for you, the implants have articulating surfaces that better match your natural shape. 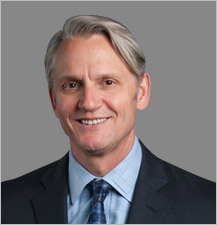 Traditional knee replacements offer "off the shelf" implants in a limited range of sizes making it necessary for a surgeon to make sizing compromises during surgery. Because your ConforMIS implant is designed to fit only your knee, sizing compromises common with traditional implants are eliminated. Traditional knee replacements require the surgeon to cut bone during surgery to fit your anatomy to the "off the shelf" sized implants. ConforMIS designs the implant to fit your anatomy therefore allowing the surgeon to preserve as much of your bone as possible. The ConforMIS approach makes sure that your implant is made to fit you precisely, avoiding sizing and fit issues common to standard total knee implants. Should you and your surgeon determine you are a good candidate for the iTotal, your surgeon will give you an order for a ConforMIS knee scan at a local CT imaging center. Your iTotal implants are then designed from the CT scan using the ConforMIS iFit technology. 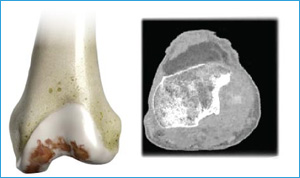 The iFit design process interactively maps the diseased joint, using your bone geometry to define the shape and size of the customized implant components as well as the customized instrumentation. That image then guides the design and manufacture of the personalized jigs and the personalized implants that resurface your knee. Your iTotal CR should be available in approximately seven weeks from receipt of the scan. The personalized implant will be shipped to your surgeon along with personalized surgical instruments derived from your CT scan called iJigs. The iJigs will guide the surgeon in determining the precise placement of your implants. Following surgery, your care will focus on reducing and controlling swelling, pain management and physical therapy. While every person's experience is different, many can weight-bear and walk with an aid within hours following surgery. Most people return to activities of daily living within 6 weeks. More physical activities such as sports may take up to 3 months. Consult your doctor or physical therapist about your individual goals and limitations. The iTotal CR Knee Replacement System (KRS) is intended for use as a total knee replacement in patients with knee joint pain and disability whose conditions cannot be solely addressed using a prosthetic device that treats only one or two of the three compartments. Only a licensed physician can help you determine the appropriate medical treatment. There are potential risks to knee replacement surgery, and individual results may vary. Before making any decisions concerning medical treatment, consult your physician regarding your options and the risks of those options. The longevity, performance and feel of any knee implant will depend on various factors, including your physical condition, your activity level, adherence to your physician's instructions, and other factors.